The Same Trip, Three Times? There are two ways to vacation: adventure mode or escape mode. For adventure, you build a trip around exploring someplace new and unfamiliar. For escape, you go somewhere comfortable and familiar that is far enough from home that you can relax. In a perfect world, you find a good mix of both. Back in 2010, a friend suggested that I try a Grand Circle Travel River Cruise**. It was a cruise down the Danube River to tour Christmas Markets in Germany and Austria. An unbeatable last minute price tag and the opportunity for a German adventure made the decision simple. This past December I took the same exact cruise a third time. I think that speaks to how good of a company Grand Circle is, as well as the charm of each of the stops on the tour (a little more about River Cruises in this previous post). With a world full of amazing locations to explore, some frequent travelers find it distasteful to repeat the same trip multiple times. On the other hand, I like the mix of visiting old favorites while discovering new ones. Though the itinerary has been nearly the same each time, the trips themselves have been dramatically different. There are always small changes in the towns over time; traveling with different people each time has given me a new perspective on familiar sights and activities; and multiple visits have given me extra time to do things that I would not have been able to squeeze in otherwise. The added bonus is that being familiar with the itinerary provides the flexibility to know which activities are must-dos and which are safe to miss. Vienna has nine Christmas Markets and some of the most stunningly beautiful architecture around. During this trip, we printed a map with directions to all of them, and made a goal of seeing every one in a day. Fans of art or music will swoon at just about every turn while meandering through the city. Melk is a quaint little town of about 5000 Austrians. 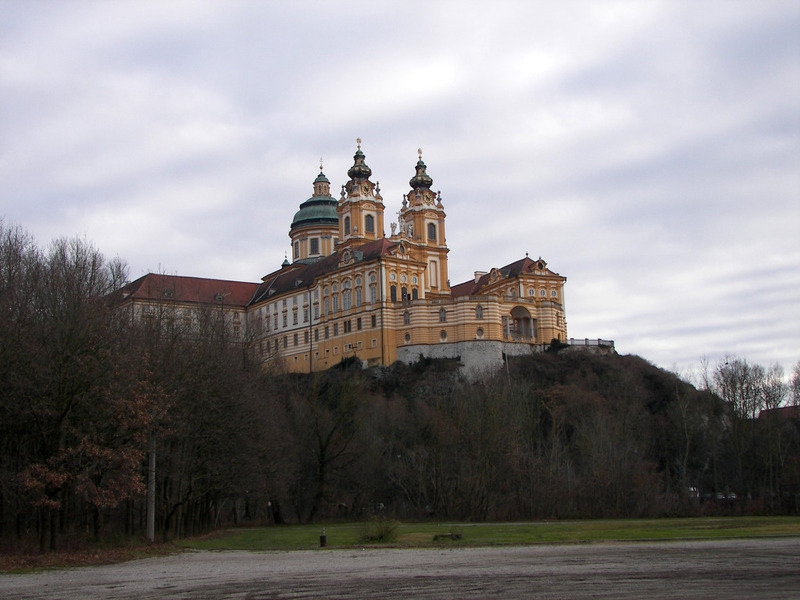 Its claim to tourism fame is an impressively ornate Baroque Benedictine Abbey high above the town. Equally impressive is the apricot schnapps and liqueur they brew there. Each time I’m in Melk, I try to stop in Cafe Piccolo for delicious homemade German food and drinks. It’s a great place to try Salzburg’s brew, Edelweiss. If you’re a lover of wheat beer, order it vom Fass (“from the barrel” = on tap). Austria’s third largest city, Linz posts a strong showing of incredible art and modern architecture. 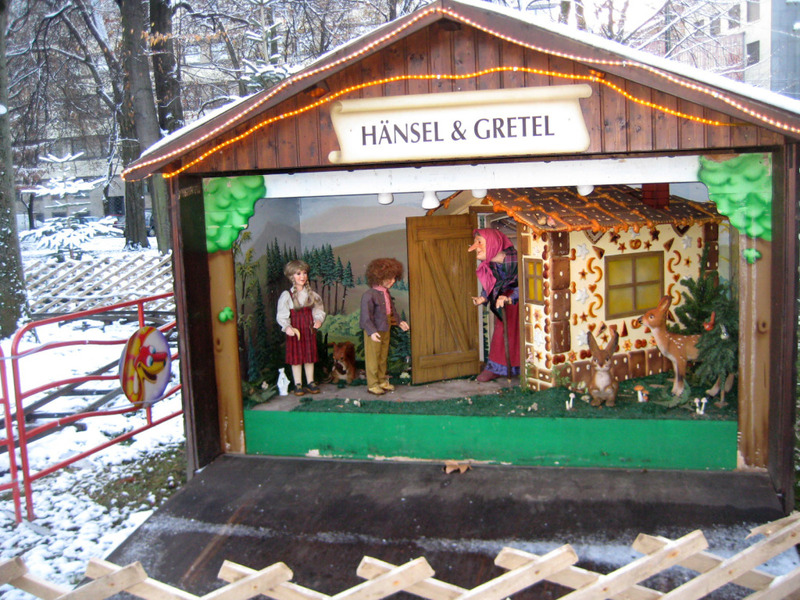 Great shopping combined with a Christmas Market featuring automated vignettes from Grimm’s original Fairy Tales make this a fun stop during the holiday season. A not particularly widely known WWII connection to Linz: Adolf Hitler’s childhood home is on the outskirts in a town called Leonding, and he had ambitious plans to supplant Vienna and turn Linz into the cultural center of the Third Reich. His parents were buried in a small cemetery in Leonding, though the grave site was dismantled in 2012. Passau ranks as one of my favorite picturesque German towns. It sits where the Danube, Ilz, and Inn Rivers collide. For the more active traveler, a hike up to the 13th century fortress Veste Oberhaus provides a stunning vantage both Passau and of the line where the blue Danube collides with the slightly muddier waters of the other two. If you’re lucky, Das Oberhaus will have a table available. 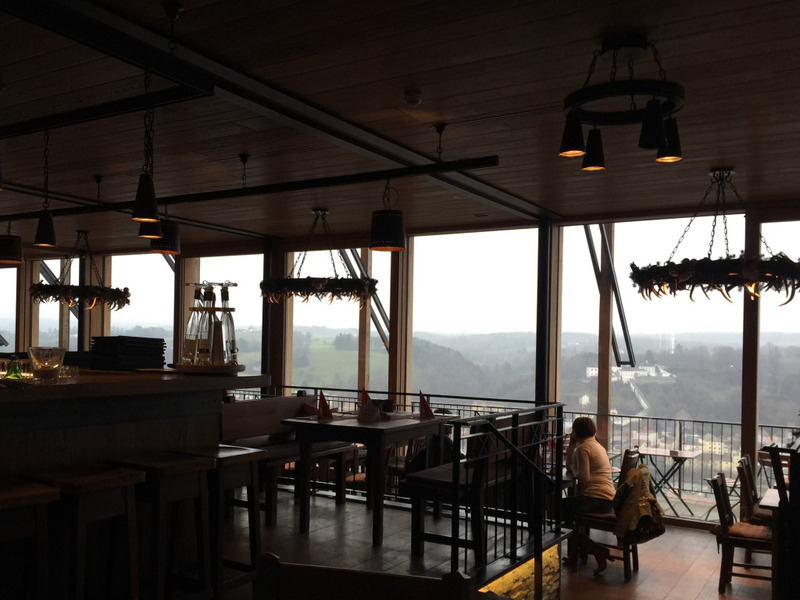 Take in the view while you share a snack platter of traditional German meats. 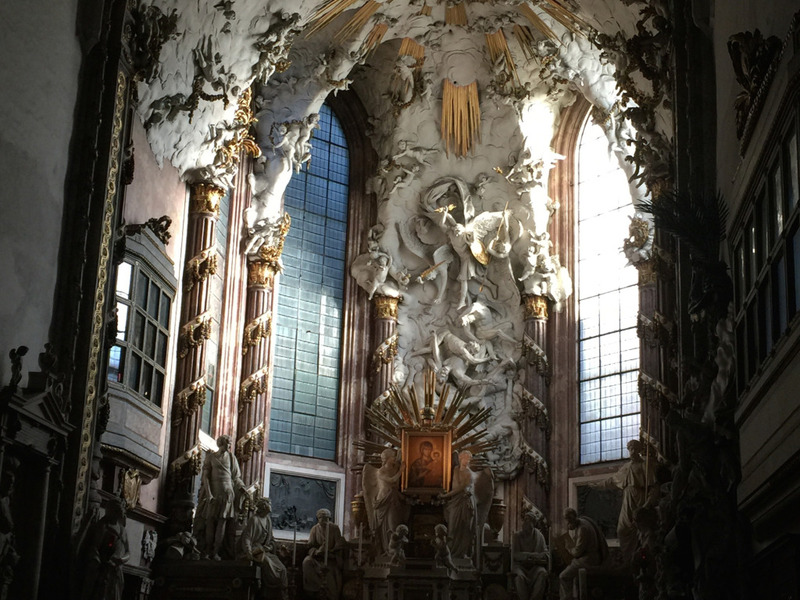 St. Stephan’s Cathedral at Passau’s center boasts one of the largest church organs on the planet. Hearing the organ rumble while it’s being tuned is a humbling experience in itself. And the Christmas Market on its doorstep retains an authentic German look and feel, despite being packed with tourists. Thanks to spending one remarkable birthday there during my first visit, I have a soft spot for Regensburg. It was spared the Allied bombing that leveled many other German towns during WWII, leaving its 12th century Stone Bridge and much of its history and architecture intact. At the foot of the bridge, the tiny Wurstkuchl boasts of feeding sausage to stonemasons and dockhands for 500 years (not a typo, five hundred!). An adjacent restaurant serves the same brats to those who prefer to sit for a more leisurely meal. Two of the Christmas Markets in town are remarkable for different reasons. Across the Stone Bridge sits Spitalgarden. It’s a brewery slash restaurant slash guesthouse year-round, with the added bonus of a small Christmas Market (Adventsmarkt) in the beer garden in the evenings. The clay Glühwein mugs from here are worth the walk, no matter how cold the night (they are without question among the most unique I have found in any city I have ever visited). Live a little, and venture across the Stone Bridge at night after dinner on your ship! 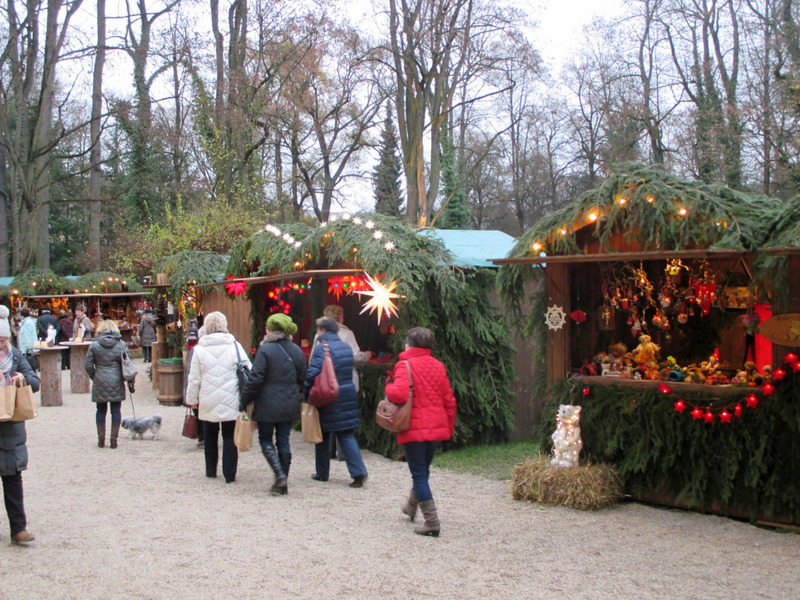 On the other end of the spectrum (and the other side of town), the Palace of the Thurn & Taxis family opens to let you wander through beautifully landscaped grounds while sampling wares from traditional Christmas Market stalls. 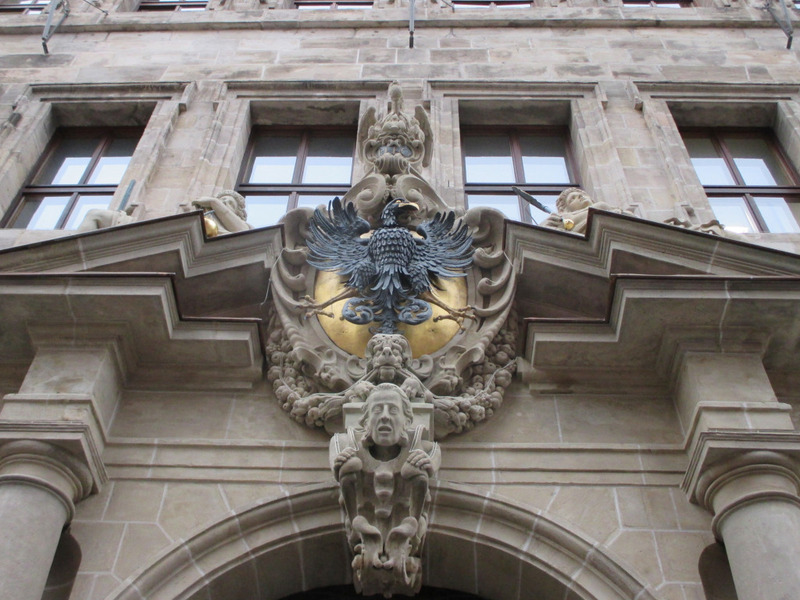 Nuremburg is rich in history of all sorts. As Christmas goes, its world famous Christmas Market is unmatched in scale, size, and popularity. Haven’t mailed your Christmas Cards yet? There’s a Deutsche Post stand in the corner that will stamp, postmark, and get them to the US for you, generally in under a week (add a little Christmas magic to your cards by filling out and addressing them before you get to Nuremburg, or even before you leave for Germany, then just mailing them from here). Each day at Noon, seven electors come out of the the mechanical clock (“Männleinlaufen”) of the Frauenkirche at the center of the old town square (also the center of the Market) to pay homage to Emperor Karl IV. For an eye level view, settle in for lunch upstairs at Oberkrainer am Hauptmarkt (directly across the square from the Frauenkirche). The decor and food are both authentically traditional German, as is the level of service. * If you’re here when the Christmas Market isn’t in full swing and still want to get your brat fix, stop in at Bratwursthäusle bei St. Sebald just up the block. For €2.50 you can grab bratwurst in a roll to go, or you can sit down for a more leisurely meal of brats and sauerkraut. If you find yourself near the train station, check out Handwerkerhof Nürnberg. It is a neat courtyard of shops and restaurants that bills itself as a “Medieval shopping area with small shops focusing on traditional crafts, plus rustic restaurants.” Add this to your list if you want unique heirloom quality souvenirs instead of typical coffee mugs and t-shirts. *A note on restaurant and bar service in Germany: if you expect or require a level of service similar to American style restaurants, you’re bound to be disappointed. German wait staff are professionals who know how to do their job efficiently. Since most German meals are intended to be relaxing gatherings of family and friends, waiters do not hover over your table or check back with the frequency Americans tend to expect. Signal your waiter when required, but be prepared to order when they arrive, and do not take offense if they are not at your beck and call or constantly asking if you need anything. **I have not been compensated for this endorsement, nor am I affiliated with GCT in any way (though they’re welcome to shower me with free loot). Special thanks to my great friend Dave Stevenson of Cleveland, Ohio. His charming yet frustrating habit of snapping 17 photos a minute for the duration of any trip is responsible for most of the photos above.